Quite a few requests coming in these days to talk about trade, its economic impact and the outlook for both the nation (new trade agreements) and local (Port of Portland marine operations) economies. There are lots of numbers flying around and it can be hard to tell which ones are accurate and which ones mislead, even for our office. First, one common way to discuss the size or impact of trade at the local level is to express the total dollar amount of exports as a share of GDP. Below I plot both the annual growth rates for exports and GDP and also Oregon’s relative ranking among all states. While Oregon’s GDP growth has been stronger than the nation’s in recent decades, so too has our export growth, by and large. 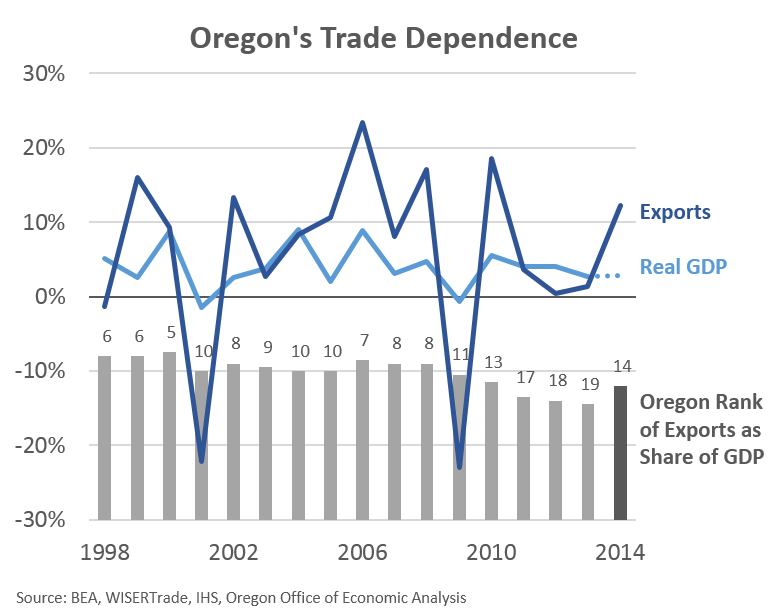 As such, Oregon’ tends to rank among the top 10 states in terms of this measure of trade dependence. However since the onset of the Great Recession, Oregon’s relative ranking has eroded from top 10 to nearly 20th in the nation. This is due to both the numerator of the ratio (exports) growing slowly in 2011-13 and the denominator (GDP) growing quickly. Mathematically this quickly erodes the measure/ratio and Oregon’s ranking falls. However, with the strong rebound in export growth in 2014 and plugging in IHS’ state GDP forecasts for the year, Oregon’s ranking improves. The economic impact of trade is important. How big is a harder question to answer, although business or trade group estimates do exist. Brookings’ has ranked Portland the second most trade-dependent metro (using the same methodology) and the Portland Business Alliance has a roundup of reports. Additionally, Jason Furman, Chairman of the Council of Economic Advisors for the Obama administration, today delivered a speech on trade at Brookings that provides a good overview of the impacts of trade. The broader discussion, to me, takes two different paths. First is the matter of traded-sector businesses. Being able to sell your products or services outside of the region and bringing back those revenues (for wages, investment, profits, etc.) has become increasingly important. At the national level, exports as a share of the economy has nearly tripled in the past 40 years or so. Finding new markets, particularly for some of Oregon’s niche industries or products (ag is a good example) is vital for business growth. Of course this is much easier said than done and all levels of government and business groups have efforts to increase trade, to various degrees of success. One potential data challenge and economic opportunity is the continued increase in service exports. Being able to grow service exports — energy consultants, engineering firms, advertising, and the like — and also being able to properly measure this growth is important moving forward. Second is the impact on jobs. Oregon’s labor market is polarizing at the same rate as the nation. Our transportation jobs have seen more negative trends, however our manufacturing sector has clearly outperformed the typical state. It’s these transportation, and related, jobs that have been impacted the most and will continue to be given the recent losses at the Port of Portland. I would argue these trends are not directly attributable to globalization and trade, or not nearly as much as they are to increased efficiencies in distribution networks, as Joe Cortright wrote in a recent Oregon Business column. Full disclosure: Joe is the chair of the Governor’s Council of Economic Advisors, our office’s main advisory group. With that being said, an ECONorthwest report on trade highlights the above average pay for many of the trade-related, Portland Harbor jobs. According to media reports, the Port of Portland jobs that will be lost pay considerably higher than this. While I am less concerned about the broader economic impact of these losses, given the size and growth of the Portland MSA or the state economy, I am much more concerned at the individual level. Given the experiences of the RV workers in Lane County, and the fact that the Port jobs pay considerably higher than industry averages, it unfortunately suggests a very rough adjustment period for these workers who lose their job. Don’t worry, while I graph real GDP growth since that’s what we care about, I do use nominal GDP to base the state comparison calculations. Posted in Employment, Miscellaneous, News, State Comparisons | Tags: Employment, Exports, GDP, job, Jobs, Oregon, rank, Real GDP, State Comparison, traded sector, U.S.